Wait, what? 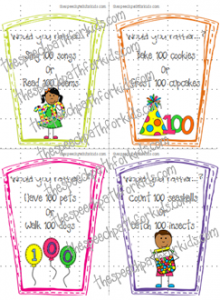 The 100th day of school is just around the corner. That seems unreal! My room is next to a kindergarten class and each morning I hear them counting the days they have been in school. My ears perked up the other day when I heard the chant go from 50s to 60s to 70s and keep going to the 80s. I often use this festive day to work on categories. We sort or name 10 groups of 10 items each. Students will also bring their class projects to share with the group. It’s always fun to see the creative ideas. One year one of my darling students was obsessed with everything pig. So her 100th day project was to draw 100 little hairs on her pig. When my son was in kindergarten he wanted to do a project using my camera. So he created a list of 10 categories (transportation, buildings, animals, etc) and we went around town snapping 10 pictures each. This year my daughter has a project due. Her idea was to eat a 100 popsicles so she could use the sticks. Hey, I give her credit for trying! 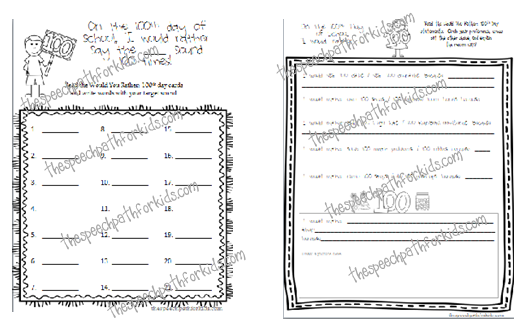 I am excited to introduce my new “Would You Rather: 100th Day of School” questions to my students. Given that Valentine’s Day, the 100th day, and the Winter Olympics are all squished into the same narrow window of time, I’ve only blocked out one therapy session for each group to work within the 100th day theme. My language groups will use the activity to practice questioning, reasoning, and conversation skills. 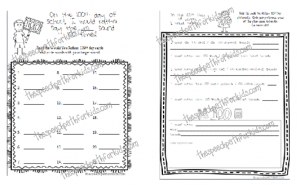 I have also created recording sheets for their use. They love being able to get out of the therapy room and interact with others across the school setting. After reading “Twas the Night Before the 100th Day of School” by Natasha Wing, my early communication groups will practice counting, labeling and grouping to sort pictures and objects into 10 categories of 10. 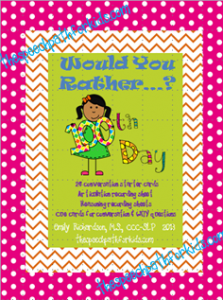 You can find the “Would You Rather” set in my TPT and TN stores. 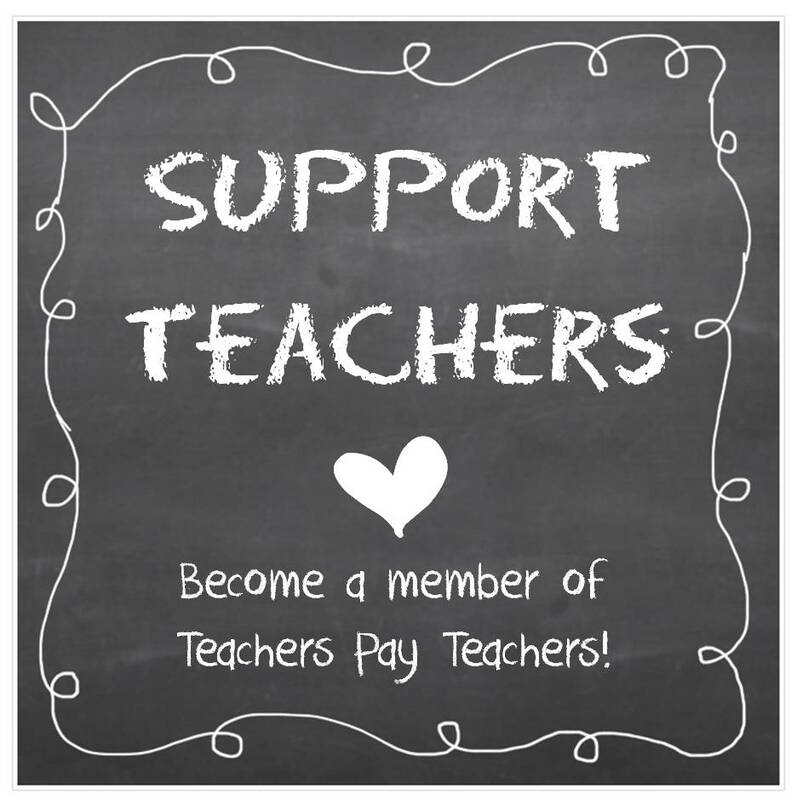 There are 100s of therapy ideas to celebrate this fun mile-marker in the school year. I’d love to hear what your groups will be doing!